I've been disappearing for a whole month and guess what?! I'm in Japan!!! I will be in Japan for 2.5 months. Why so long?! Actually, it's a pretty similar concept to what I was doing in Korea - VOLUNTEERING! After having gone through these 2 programmes, I realised the meaning of volunteering - doing something without MONETARY returns. In Korea, I went to a cultural exchange volunteering program. This time, too, is a cultural thing, but more towards hands-on cultural thing, for this program, it's known as internship. This VOLUNTEERING internship programme is organised by Holiday Club which they collaborate with ICLS, the place where I took Japanese lesson. Apparently anyone who took Japanese lesson in ICLS could join this programme. However, in the first batch, there was one person who is not a student for ICLS, but she is able to join the programme with certain condition, of course. October 16th is my birthday. This year, it falls on the Monday. As I have to work on the Monday, the celebration with my family was done a day earlier. As usual, we kids ordered a cake from my aunt. My order this year was - a cake that everyone can eat. The reason is because my beloved grandma doesn't like anything that has the smell of dairy product. So, in the past, she didn't have any of our birthday cakes. I didn't really like that, which was why the special order this year. 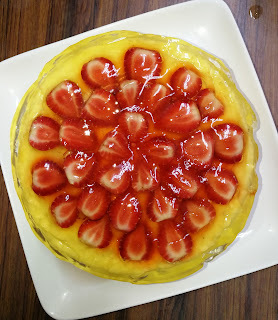 To be honest, it was the worst texture cake I have ever tried, but to see that everyone can eat it, I was very happy. It was the best cake. My aunt also fermented a grape wine to be opened during this day. So, last Wednesday was Mooncake Festival aka Lantern Festival. But who celebrates a festival for only a day? Usually one week, right? My aunt would definitely not miss this event to bake mooncakes. She baked mini white lotus mooncakes with salted eggyolk, specially for us kids. 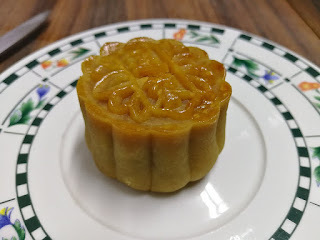 Without the egg yolk, the plain white lotus moon cake is too sweet for me. Last Saturday, my neighbourhood committee also took this chance to organise a small Mooncake Festival Party, where families living in the neighboorhood could join in the fun. A simple, Malaysian-friendly food was prepared by the committee. Of course, they did not forget to prepare the main characters for this party - mooncakes and lanterns. I tried to take some good shots, but... no skill means no skill. Opening Ceremony (OC) It's finally the day that we were waiting for. All volunteers were scheduled to duty on that day to assist. I was not exempted. There was supposed to be a briefing at 2pm. However, as I had something to do, I could only arrive at about 5pm. By the time I arrived, I immediately went to the gate our group was assigned to and had a little short briefing with my team. We basically guide the visitors to their seats from the time I arrived till the end of the event, at about 10pm. However, the instructions given were not cleared that everyone had a different interpretation. It was a chaos, but we tried to be flexible and did what we could. The 29th SEA Games has ended about two weeks ago. 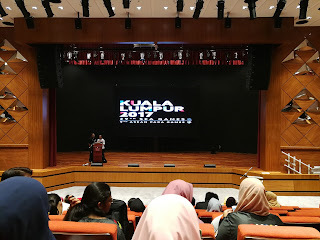 I thought of posting my volunteering experience earlier but as I was quite busy, it is delayed till now. 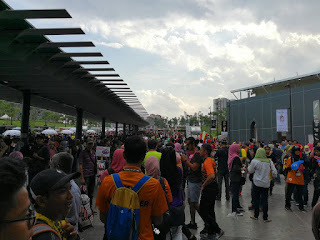 The 29th SEA Games event was held mainly in Kuala Lumpur from 19th of Aug till 30th of Aug. Being a host country after 16 years, how could I not join in the fun? And so, I applied to be a volunteer last year July. Of course, I pulled my sister to join in as well. Through the official webpage, we were required to fill in our details and were allowed to choose the games and position we desired. All done and what's left was to wait for the result.